In October, Yale University hosted the “Frontiers in Star Formation” meeting in honor of Richard Larson, a valued professor who has now retired from the Department of Astronomy but whose contributions have significantly benefited not only the department but also the larger astronomy community. Adhering to Professor Larson’s wishes, the meeting was not a direct tribute but rather a forward-looking assessment of the study of star formation. Evidence of Professor Larson’s impact on the field, the meeting drew some of the top names in the sub-field of star formation, including theoretical and observational, galactic and extra-galactic, all of whom cited Larson’s work. Chances are that if you have taken a course on star formation or the interstellar medium (ISM), you may have learned “Larson’s Laws”, the term coined not by Larson himself but rather by the professors teaching these fundamental trends from the historical Larson (1981) paper which describes the relation between stars and the molecular clouds where they form. These relations based on observations provide an important confirmation of early theories of star formation, and Larson explains the implications for the origins of protostars and molecular clouds. This study can be considered an early version of data-mining, or a survey of molecular cloud characteristics, and it provides an important example for theorists on how to use observational data to constrain their theories. Data presented by Larson (1981) include cloud complexes consisting of many clouds, individual clouds, and clumps of density enhancements within clouds, so that size scales are studied over several orders of magnitude. Data were found in the literature from 1974-79 (38 references in total), consisting of observations of various molecules including carbon monoxide, H2CO, NH3 and others found in molecular clouds where stars are thought to form. In fact, Larson is not an author on any papers cited for the data included in his table, but it is his comprehensive collection and study of these regions that sheds light on the overarching questions of environmental conditions where stars are forming. 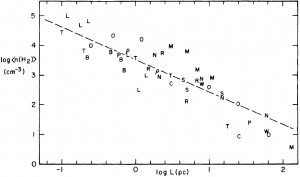 Figure 1 from Larson (1981) shows the relation between velocity dispersion (sigma) and linear size (L) of molecular clouds. The letters identify the regions observed (listed in Table 1 of the paper). Figure 1 in the paper shows the velocity dispersion (sigma) plotted as a function of region size (L). Velocity dispersion is the “three-dimensional rms velocity of all internal motions”; in other words, the typical local speed of gas molecules within the region. The regions studied show a power law dependence of velocity dispersion on region size, for regions with sizes ranging from molecular clouds to smaller components. The relation shows that larger regions have more turbulence, and smaller regions less turbulence. Moreover, the power law with exponent 0.38 fits the data well, and is similar to the Kolmogoroff Law for turbulence of small eddies super-imposed on larger ones. This gives a physical insight into the kind of motion observed. 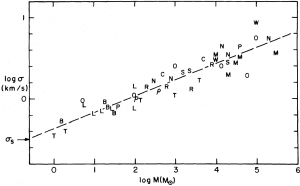 Figure 3 from Larson (1981) shows the relation between velocity dispersion (sigma) and mass (M) of molecular clouds. The letters identify the region, as in the previous figure. It is found that most regions studied are in approximate virial equilibrium (i.e., gravitationally bound). This balance should exist in molecular clouds of many independently moving clumps or subregions, for which turbulent internal velocities are supporting the cloud against overall collapse. Larson suggests that some clouds may be collapsing due to gravity, but that the observed motions show that gravitational collapse does not happen as simple radial free-fall. The observed characteristics of irregular, filamentary substructures within molecular clouds agree with this picture. 3. Density: Cloud size is inversely proportional to density. 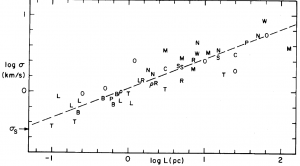 Figure 5 from Larson (1981) shows the relation between density and size (L) of molecular clouds. The letters identify the region, as in the previous figures. Density is simply mass divided by volume, and volume is proportional to radius cubed, so density is proportional to mass and inversely proportional to the linear size of the cloud cubed. Cloud size and cloud mass are described by the first two relations, which can be combined to show that cloud mass is proportional to size raised to the 1.9 power. Then, bringing together all the relations we’ve seen so far, density is thus inversely proportional to cloud length raised to the 1.1 power. Further, it is shown that column density, which is volume density times cloud length, is nearly independent of cloud size. Larson details the implications of these data on the minimum size of protostars and the origin of molecular clouds, spanning several orders of magnitude in size. The results show that the minimum mass of a protostar is about one tenth of a solar mass (Larson also cites a range of 0.05 to 1 solar masses), and the minimum size is about 0.015 to 0.1 pc. Also, the timescale for a molecular cloud is about 10,000,000 years, after which the cloud will be dispersed or restructured. Since these aren’t the main findings of the paper, but rather conclusions drawn based on the data and the relations described above, I refer you to the paper to learn more. 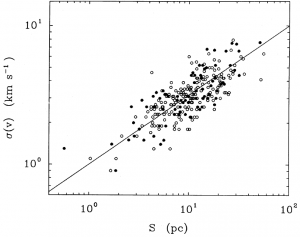 Relation of size (S) and velocity dispersion (sigma), from the Solomon et al. (1987) study of 273 molecular clouds in the Milky Way. Compare this fit, with a power index of 0.5, with that of the first figure from Larson (1981), which has a power index of 0.38. More than 30 years later, and with much more data in hand, do the relations and implications above still stand? The simple answer is yes! More recent studies (i.e. Solomon et al 1987, Heyer et al. 2009) have found a slightly steeper power index for the first relation, or different values for surface density of a molecular cloud in the third relation, but the qualitative trends hold quite well (see also Bolatto et al. 2008 for an extragalactic take on the issue). For example, based on data for more molecular clouds observed in a higher-resolution survey of CO, Solomon et al (1987) better constrain the power index of the first relation to be 0.5, rather than the 0.38 of Larson (1981). Papers like that of Lombardi et al. (2010) have tested the relations with a broader range of data to verify whether the “law” is a result of limited dymanic range of the data used by Larson (1981). Lombardi et al. (2010) tested the third relation and found that entire molecular clouds are characterized by a universal structure as Larson (1981) claimed, but single clouds and cores, i.e. the smaller objects tested, cannot be described by a constant column density. These are examples that Larson (1981) did an effective job discovering relations with the data available at the time that have helped us further our understanding of star formation and have inspired astronomers for decades to constrain these relations with a range of data. Observations with the newest telescope facilities will target the lower-mass, smaller-scale objects to further understand the early stages of star formation. Retired yet still active and up-to-date with current research, I think that Richard Larson himself will be excited to see the new data come in. Thanks very much to Prof. Guido Garay at Universidad de Chile for suggesting the following list of papers by Richard Larson. According to Prof. Garay, he recommends that his students read these papers for a thorough understanding of star formation.